Prince Charles has suggested Prince Harry and Meghan Markle will bend royal protocol by naming their forthcoming child something much more modern than is tradition. During his remarks at Australia House in London, the future King of London touched on his son and daughter-in-law's recent trip to the land down under, where he said they were offered "countless, thoughtful" ideas for their son or daughter's name. As Prince Charles put it, "Just between us... just between us, I suspect that Kylie and Shane may possibly make the short list. But ladies and gentlemen I would not hold your breath for Edna or Les." Princess Kylie or Prince Shane definitely has a ring to it! 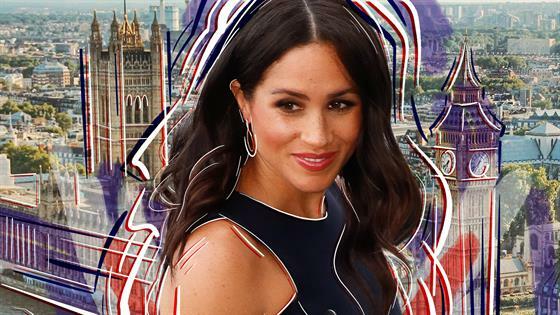 For the Duke and Duchess of Sussex to pick a moniker without any significance to the British royal family would be quite extraordinary, especially given the historically rich meaning behind Prince William and Kate Middleton's children's names. Prince George was named in honor of Queen Elizabeth II's father, while Princess Charlotte's full name (Charlotte Elizabeth Diana) is a nod to Prince Charles, the Queen and the late Princess Diana. Likewise, Prince Louis' name has plenty of ties to royal relatives who came before him. Prince Charles' loose lips is far from the first time the newborn's name has come up since Prince Harry and Meghan revealed their pregnancy in October. In fact, the mom-to-be has also mentioned the "long list of names" she received from well-wishers on their trip to Australia. One in particular struck a chord with the beloved couple, according to 5-year-old Harriet, who met them in Melbourne. "As soon as I introduced my daughter to Harry, he said, 'That's a great name,'" Harriet's mom told reporters. "Maybe they will choose it for their own child, which would be fun." In announcing their pregnancy last month, Kensington Palace shared in a statement, "Their Royal Highnesses The Duke and Duchess of Sussex are very pleased to announce that The Duchess of Sussex is expecting a baby in the Spring of 2019. Their Royal Highnesses have appreciated all of the support they have received from people around the world since their wedding in May and are delighted to be able to share this happy news with the public."